By Carol W. Mulder. He was a very classic horse with great appeal and he was an outstanding sire of unusual prepotency. Several Crabbet oriented breeding programs have utilized this blood, as well as many very different breeding programs, widely scattered, with quite dissimilar goals. 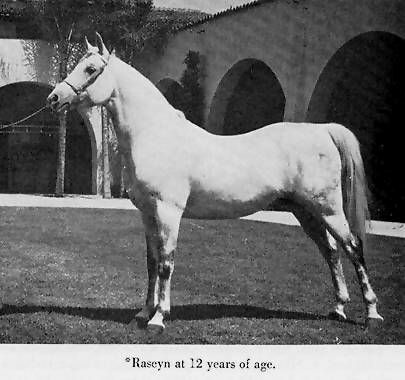 Some of the breeding plans using *Raseyn blood have inbred heavily to him (this began, in a few cases, even during his own lifetime), while others have preferred smaller more or less “single shots” of the particular qualities *Raseyn offered.